Enter the Onkyo TX-SR608. It's one of the world's first 3D-capable AV receivers, it's THX- Select2 Plus spec, and it offers Dolby Pro-Logic IIz height channel processing – super. But the biggest, sassiest feature of Onkyo's TX-SR608 is not the spec sheet eye-candy or its position at the cutting edge of home cinema, it's the price – just £450. 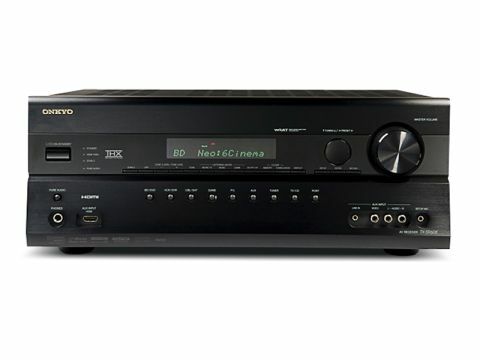 See all the other Japanese manufacturers weeping over their budgets as Onkyo sets the price bar for entry-level 3D capable receivers very, very low – in fact, even its £250 TX-SR308 is 3D-capable. The SR608's key feature, the one it has genuinely launched (just) before anyone else, is HDMI v1.4a connectivity. This allows 3D passthrough from a suitable 3D source to a suitable 3D display device, meaning any receiver with v1.4a HDMI connectivity can simply 'switch' 3D signals. This feature has also been leveraged to pass-through HDMI audio and video from source to the TV when the receiver is in standby, very handy for late-night viewing. Likewise, the v1.4a spec offers an HDMI Audio Return Channel, meaning this receiver can amplify the sound from your off-air TV-viewing without any other hook up. All those quality HDMI features are topped with quantity, too – a class-leading six inputs, one usefully positioned on the front fascia for easy access. Behind the headline features, the SR608 packs in a lot of nice-to-haves as well. There is an all-new seven-channel power amplifier, claiming a rather skewed 160W a-piece by quoting the figures into a 6Ω load with a 1kHz signal with only one channel driven. That is like a car manufacturer quoting a vehicle's 0-60mph performance going down a steep hill with the wind behind it – we measured a two-channel 8Ω figure of 135W in our tech labs. Onkyo uses a three-stage inverted Darlington circuit configuration amplifier, offering very low negative feedback operation (so likely to be more natural sounding) with the disadvantage of a lot of ancillary control circuitry involved to keep the system in check. It's certainly not a low-heat design, but the TX-SR608 packs in an ultra-quiet fan. The rest of the features form an affordable receiver hot-list, including 1080p upscaling from Faroudja, Burr-Brown DACs to buff up the audio and twin parallel sub outputs, which is still 7.1, not 7.2 as Onkyo claims. Okay, there is no USB input capability, but adding to the DPL IIz channel mix this receiver also sports Audyssey DSX height and width channel processing. With only seven powered output channels there are choices to make – front height or width or rear-back speakers? Purists would suggest that rear-back is the way to go as there is a fair bit of content out there with 7.1 encoding. Conversely, one might argue that expanding the vertical soundstage with height channels offers a lot more wow factor for most 5.1 encoded movies. Ditto width. Personally, I don't have enough genuine 7.1 channel recordings to worry about – and the added cinematic scale with height channels is frankly stunning compared to any linear array. The good news is that you can chop and change easily to see which you prefer before getting the drill and Rawlplugs out. Powered up, the TX-SR608's graphic user interface is very slick and intuitive. There is super-fast access to any feature (Denon – please note) and menus that scroll like they are on rails. Well-oiled rails, too – sometimes overshooting if your digital dexterity is a little tardy on the remote. Setup is straightforward in manual mode and you have Audyssey 2EQ set-up with a supplied microphone for automated set up and basic room EQ. While romping through the Audyssey pick-n-mix shop, Onkyo also bagged Dynamic Volume and Dynamic EQ for this receiver – ensuring that the audio balance remains good from a quiet night in with a chick flick to a 'never mind the neighbours – feel the width' action movie fest. I prefer the latter. Eschewing USB inputs and multichannel analogue inputs/outputs at this price point is bold, but I know why. The TX-SR608 is a home cinema receiver through and through. It's geared up to rock your sofa with high-class hi-def material and it pooh-poohs low-quality MP3 or compressed video with scarcely concealed disdain. Cutting straight into Marcus Miller's The Panther from the Legends of Jazz Blu-ray compilation, the Onkyo sounds rich and fulsome with a transient attack that leaves most mid-priced receivers wounded and bleeding. Each slap-bass note is carved into the air with precision and cranking up the volume shows plenty of muscular reserve. It keeps tight and focused even at the display's indicated THX reference level. Not surprisingly, the all-action sequences of the mighty Avatar rip into the room with huge scale and immersive effects even in vanilla 5.1 mode. With all seven channels driven hard and filling the room, Dolby DPL IIz height proves a little more cohesive than the Audyssey's DSX height mode. Dialogue has a crisp, forward sound, never falling into excessive sibilance but making sure the spoken action is right up in front of the mix. Trimming maybe half a dB more from the centre channel seems to present a more even balance across the front end and makes for a really smooth soundstage. Moreover, unlike some of Onkyo's earlier budget receivers, the SR608's balance is not particularly volume dependent. It sounds fast and fruity from gentle listening all the way to ASBO reference level (which is between 5dB and 10dB above THX reference level, depending on your neighbours). With the more emotionally intense Up on Blu-ray the Onkyo continues to set the standard at this price. Dialogue remains lucid and articulate without dominating the sound and the music swells with impressive cinematic scale. Quiet rear effects seem a little stuck inside the speakers rather than soaring out into the room, but this is not something you would notice unduly. There are also a few 'noises' in evidence when the volume is high but the content silent; a constant gritty hiss and some very quiet very static-like noises every time a light or electric appliance is turned on around the house. It's certainly no worse than most budget receivers for noise, but if you like to feel your movies as much as hear them, expect to get a few pops and clicks. There is good reason why Onkyo chose Faroudja's proven DCDi scaling engine – because it works very well indeed. Blowing the dust off Heat on DVD, the 1995 SD picture is given a whole new lease of life and crafted in near HD quality. Using a 1080p projector and 120in screen you can still see a lot of softness in the edges and it lacks the depth of a Blu-ray transfer, but on a 42in LED Samsung TV it looked sharp and vibrant. There were no syncing issues between the different displays and the receiver, no hiccups, no delays or flashing screens before everything shook hands and started talking to each other. In the brightly-lit heist scene, De Niro's craggy features are crisp and expressive and even as the camera pans up and down the high street the motion remains smooth and under control. As the guns open up, echoing from the tall buildings, you are treated to a master class in Dolby Digital entertainment. The Onkyo's speed and dynamics rise to the occasion with bullet-speed alacrity, creating a huge all-action theatre that justifies every penny of the 450 quid on its own. If you don't find yourself on the edge of your seat with your heart racing by the time De Niro is dragging a wounded Val Kilmer into the car, you should probably check you still have a pulse. So, a £450 AV bargain. A few things have to go to get a technology packed unit down to this price – the speaker terminals wobble alarmingly and bend downwards if your cables are a bit weighty, the case-work is somewhat lightweight and each button press creates a tingy-rattle of a click – but you can't have everything. Neither can you fault the features, audio aplomb or the video performance of the TX-SR608. Add in the v1.4a HDMIs and the option of height or width channels and you have a solid Best Buy receiver that leaves its peers trailing in its wake.